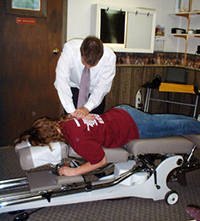 As a Palmer Graduate, Dr. Matthew H. Gauck has been highly trained and educated to utilize various adjusting techniques, such as Gonstead and Diversified Systems, to find and correct problems relating to the spine and extremities. On occasions due to a patient’s unique condition, such as degenerative arthritis or osteoporosis, gentle, low force techniques, such as Activator and Thompson Techniques, can be utilized for best results. Decompression Traction System, or DTS, is a highly researched, highly effective treatment for individuals with spinal disc-related problems in the lumbar spine, neck or even the wrist. DTS is a non-surgical alternative for back and neck pain due to bulging or herniated discs. DTS relieves pressure on structures that may be a major source of pain. This system of precise, cyclical, painless stretching reduces pressure and promotes blood and fluid flow. This unique therapy improves healing naturally. 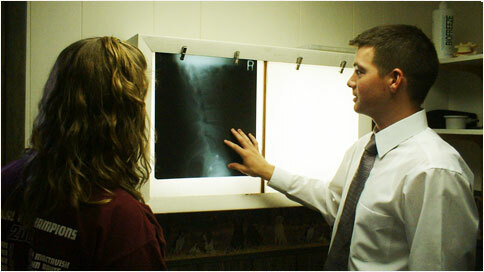 At times, the use of X-rays, CT’s, or MRI’s are necessary to better understand the extent of a patient’s condition. Based on a patient’s examination findings, it might be determined to utilize diagnostic images to further evaluate a patient’s symptoms. Because of a great professional relationship with the staff at Decatur County Memorial Hospital, x-rays are taken when medically necessary. All x-rays are read by a licensed radiologist and reports and images are accessible in Dr. Gauck’s office for review and education. Because of this wonderful working relationship, patients can have the state-of-the-art access and a clear understanding of their condition. Some patients' path to better health may be one that needs the use of various therapeutic devices to speed up their recovery or help manage their condition better, whether it is done at home or in the office. Muscle stimulation, TENS therapy, heated-dry hydrotherapy and cryo-therapy are just a few of the types of therapies available at Dr. Gauck's advisement. Gauck Chiropractic offers therapeutic massage for patients that have conditions that could improve with the expertise of our licensed massage therapists. A hands on approach to soft tissue healing, massage therapy, can improve muscle function, lymphatic drainage and overall health of the body. By understanding the functions of the body, a person can greatly affect one's overall health utilizing different types of nutrition and herbs to improve the symptoms of different conditions. Dr. Gauck invests his spare time educating and understanding the use of whole food supplements and herbs. We utilize Nature's Sunshine and Standard Process products because of the high standards set to guarantee quality. Same day appointments for DOT Physical Exams are routine in our office. Drug Testing and Breath Alcohol Testing is coming soon. Find a DOT Medical Exam near you. Our map of National Registry Certified Medical Examiners makes it easy to find a provider. If you need a CDL physical, flight physical, merchant mariner medical exam or school bus physical, TeamCME is the right place. For more information visit www.TeamCME.com. Find me at www.TeamCME.com. In addition to working closely with the Radiology Department at Decatur County Memorial Hospital, Dr. Gauck has developed close working relationships with medical doctors, nurse practitioners, physiatrists, pain management specialist, foot and knee specialist to offer the best referral possible when needed. Chiropractic care is wonderful option for a lot of different conditions, but getting the patient feeling better faster and most effectively is our first priority. Contact our office today with questions or to set up an appointment with Dr. Gauck and get back on the road to good health!